A coming-of-age tale about 5 young women in South Korea with universal appeal. Cinema can list a never-ending array of coming-of-age dramas in various forms. Inevitably, many vying for your attention will go unnoticed in an over-crowded market place, needing a hook or gimmick to gain your attention. 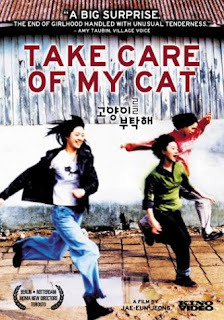 Despite its title, "Take Care of my Cat" is a relatively gimmick-free look at the end of teenage years in the frugal career of Jeong Jae-eun. To start, we are introduced to five young school friends, taking photos at the end of their school career, laughing and joking. About two years later, the five girls who are now young women are trying to find their place in the world. Hye-joo (Lee Yo-won) has left Icheon for Seoul and a seemingly high-flying job; Chinese-Korean twins Bi-ryu (Lee Eung-sil) and Ohn-jo (Lee Eung-ju) wheel and deal as street traders; Tae-hee (Bae Doo-na) works at her parents' hot stone spa, typing poetry for a disabled writer; and quiet orphan Ji-young (Ok Ji-young) lives with her deteriorating grandparents as she dreams of becoming a textile designer. But meeting up again for Hye-joo's 20th birthday party, clear differences start to emerge between the group, a far cry from their school days. Presented in a box she designed herself, Ji-young gives Hye-joo a stray cat she found. Ripping the box apart, Hye-joo soon returns the cat, stating she doesn't have the time for it. Previously the closest two in the group, the pair become increasingly distant when together, Ji-young clearly feeling left out as Hye-joo moves on to her new life. The twins peripheral, the main trio's struggles with adult life become the focus: Tae-hee feels trapped in her parents' business and dreams of escaping abroad; Hye-joo is constantly reminded that she is a low-wage earner in Seoul and needs to show more ambition to achieve, as she sees new joiners surpass her; and Ji-young is left alone as the shack she lives in collapses, killing her grandparents. Failing to cooperate with the police, Ji-young finds herself in junior detention, before Tae-hee decides enough is enough and the two run away to foreign lands, leaving Hye-joo trapped in her menial job in Seoul. Loss of innocence is always a theme of coming-of-age films, hitting hard now that the girls have left school. Outside of school and out in the big, wide world, the differences in social status become more marked. Seemingly upwardly mobile Hye-joo, the natural leader of the group, naturally moves to near-by Seoul to carve out a career in the capital. This is contrasted by former best friend Ji-young who lives in near poverty in a shack with her grandparents, unemployed, finally winding up in prison. With the safe hub of school now gone - where you're all in the same boat - literally keeping a roof over your head is now your concern, and the quality of that roof becomes more noticeable. This creates tensions within the group as they no longer understand each other's lives. But while she may show more ambitions relative to her school friends, Hye-joo is clearly another insignificant fish in the sea that is the capital city. Without the qualifications of her peers, she is destined to remain as a "low-wage earner." Having left for the big city, she has also left the comfort of the friendship circle. Remaining at home, Tae-hee and Ji-young grow ever closer; with the entrepreneurial twins seemingly happy as long as they have each other - perhaps necessitating their role in the film. Jeong Jae-eun paints escape as beyond the country capital. The world is a key theme throughout, with Hye-joo's office having a map of the world printed on its glass wall, though she will only ever see the Seoul skyline from the office window. Tae-hee continually looks for ways of going abroad, but often doesn't have the means. Ji-young also harbours quiet ambitions to study textiles abroad, though perhaps hides it merely as a pipedream. In the end it is this pair, that seem to be procrastinating into their twenties, who are the ones who truly escape. Jeong's themes are universal and not just the anxieties of young women in South Korea: they can be applied to many countries in the world and to many people. "Take Care of my Cat", therefore, is relatively gimmick-free for a coming-of-age drama; the titular cat of little relevance, other than it passes through the hands of all five characters, showing that they still consider each other as friends they can count on. 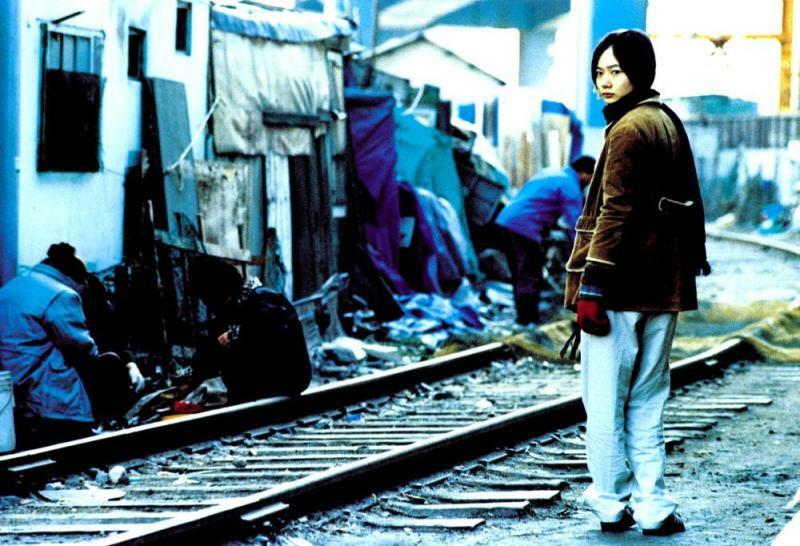 Focusing on the more industrial parts of the city of Icheon, rather than glamorous waterfront, Jeong shows a bleak picture of the adult world, which Tae-hee and Ji-young reject rather than accept as Hye-joo has. Tae-hee emerging as the true ambitious leader of the group was to be reflected in real life. In the sixteen years since it was made, Bae Doo-na, here in one of her early roles, has gone on to be a major international star, while Lee Yo-won has been restricted mainly to TV roles, model Ok Ji-young having a dotted acting career, and the twins essentially not seen again. Jeong Jae-eun herself has gone on to have a relatively modest career in shorts and documentary after her debut feature. The poor box office performance prompted something of a re-release - perhaps why much of the promotional imagery reflects little of the film's actual content - but "Take Care of my Cat" stands up against the test of time. And while it may not have big city glamour, its themes can be felt the world over.